Olivia's birthday party went well. You might be wondering why that is something that I must state, because a kid's birthday party is really supposed to go well. Indeed they are generally effortless in many ways. Having a child born around Mother's Day is far more difficult than you can imagine. Having a birthday party is such a big deal to little ones, they want the BIG celebration, they want to share their day with friends. 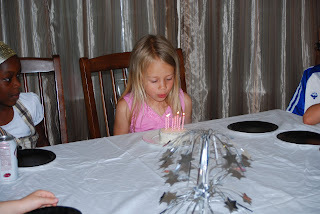 When your birthday is near a holiday it becomes tricky to plan for that celebration. Often we have skipped on the party for Olivia because of all the other commotion going on, letting it melt into the busy moments of our weekend. I was determined to not allow her birthday fall behind us being lost amongst the holiday. We began thinking about ideas and just about every one was not going to work. Finally we came up with an excellent and easy idea. Her theme for the party was Hollywood Matinee. We designed invitations that included movie tickets for the entry. She requested that the guests arrive dressed as a movie star or a favorite movie character. I had loads of other ideas such as drawing the Hollywood walk with stars out front, handing out sunglasses, having a red carpet, but, well, maybe another time. We stuck to the important and fun ideas like balloons, cake and concessions. Using the lemonade stand as the concession stand we displayed popcorn and candy there for the VIP guests to select. The theater was located in the basement whereby the guests had to walk through a black "curtain" to enter. They took their treats with them and settled down in their seats. Although the actual watching of the movie was not how I planned it turned out just fine. Surely I was not to expect them to watch the entire movie without getting up and walking around was I? We enjoyed seeing the kids dressed up and watching them get excited about the popcorn in the popcorn boxes. Because popcorn, in popcorn boxes, now that is what makes it fun. This party was fun for her, she enjoyed spending the afternoon with all of her friends and that's what made it special. at least your kid wasn't born after Christmas. I should have planned that one better.